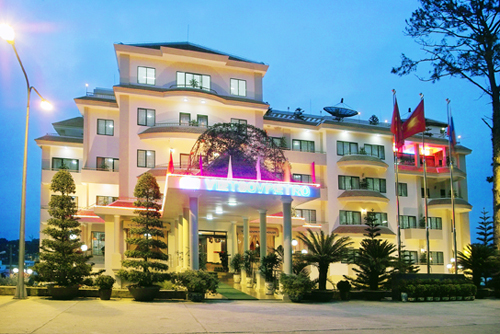 Vietsovpetro Hotel was established in 1999, is one of the youngest three-start Hotel in Dalat. We have built it excellent by offering the best value and badge .The Hotel provides a peaceful, quiet & intimate atmosphere of classic European style. The management & staff cordially welcome you to the Vietsopetro Hotel. Whether you are on business or holiday, our well trained, professional staffs are waiting to let you experience the sincerity & warmth of Vietnamese hospitality & quality service. Here at the Hotel, we always remember that you – our guests are most valuable asset. Vietsovpetro Hotel offers 4 Suites, 68 Deluxe Rooms. All rooms suite have splendid view to the city and hill, each taste fully appointed with art-deco, orient furnishings and Vietnamese objects d’art, and providing exclusive accommodation for discerning travelers. Junior Suites feature a large, comfortable living room and three separate bedrooms with luxurious bathrooms en suite. Designed to inspire, these exclusive suites ensure comfort, convenience and privacy. Deluxe Room features spectacular views of the city, hills and gardens. Our private karaoke rooms are decorated with unique styles and equipped with to of the line audio visual equipment. Just at the moment you enter into, you will have inspirations to have such a great performance. A wedding at Vietsovpetro Hotel is like heaven on earth as no other hotel is so completely dedicated to couples in love. A wedding at Vietsovpetro Hotel is the perfect start to a perfect marriage as “happily ever after” begins here. Equipped with full of all kinds may exercise a modern, you will feel comfortable and really leisure time after the exercise here. The meeting rooms at VietsovpetroHotel offer you flexible places. Whether you need a space for 200 guests or a70-seat Deluxe VIP hall, we can customize our facilities to meet your individual needs and ensure a successful event. We are also delighted to help organize special theme evenings and group activities. - IDD telephone with extension to bathroom. - Noblesse club: sauna, body & foot massage, steam bath. Jacuzzi separated service for Ladies & Gentlemen. - Same-day laundry & Dry-cleaning. - For a meal, snack or refreshing beverages, Vietsovpetro Hotel restaurants and bars offer a variety of venues. - For a memorable dining experience with magnificent sunset views, you are invited to the show case hill front VSP restaurant. Our “VSP”restaurant Rang Dong restaurant with 400 seats capacity offer a wide selection of traditional Vietnamese, Asian Western dishes which will tantalized your taste. Guests can view the city night enjoy romance piano during meals, served by graceful staff in a cozy atmosphere.